An artist has shipwrecked Le Corbusier’s Villa Savoye off the coast of Denmark’s Vejle – or so it would seem. But architecture fans need not fret. The real deal is still standing outside Paris. Asmund Havsteen-Mikkelsen has actually built a 1:1 facsimile of the Le Corbusier’s glistening 1929 design, made from wood and styrofoam. 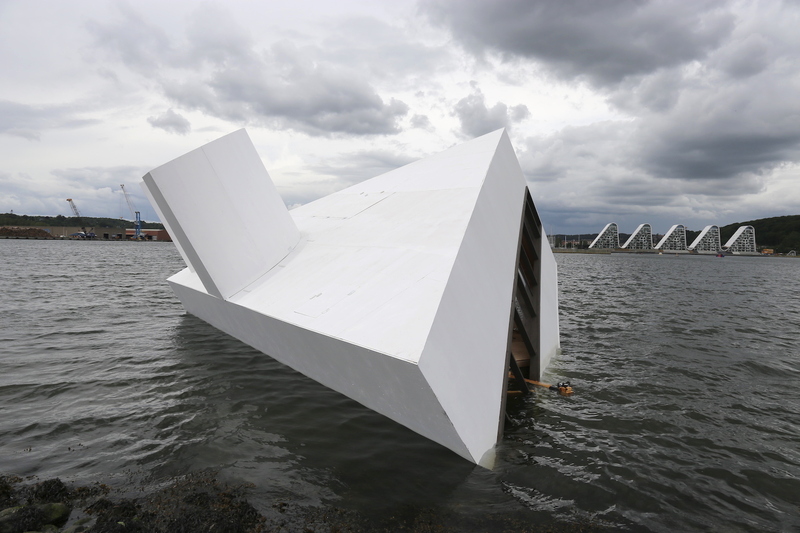 Dubbed ‘Flooded Modernity’, the work is moored off sure for Vejle’s Floating Art Festival. Havsteen-Mikkelsen cryptically describes the project is a ‘comment on the “sinking” of the public sphere after the disclosure of the Cambridge Analytica scandal and the manipulation of democratic elections through social media’. It’s not the first time the artist has drawn upon Villa Savoye in his work. He has made over 25 drawings of the house – arguably Le Corbusier’s most famous residential project – and painted it nine times. The sculpture was towed into place by a boat and will remain anchored at Vejle Fjord until 2 September as part of the festival, which promotes local young artists and architects. Other floating sculptures in this year’s lineup include a carpet by Tina Helen, a message in a bottle by Kristian Blomstrøm Johansson, and a replica of Apollo 11’s re-entry shuttle by Søren Thilo Funder.